Celebrate the bold life of Katharina (Katie) von Bora Luther and help to raise up bold women of faith for generations to come. All gifts to Katie’s Fund support ministry in three areas: leadership development, global connections, and living theology. Katie's Fund was established as an endowment in 1997. Since then Katie's Fund has raised over $1,000,000. The interest income is used each year, helping to grow and generate more support for ministry, year after year. 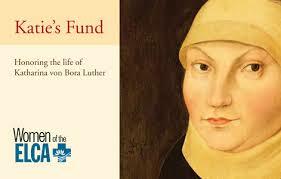 Learn more about Katie Luther in A Bold Life of Faith: Katharina von Bora Luther at www.womenoftheelca.org. Each year at our convention in September we sell items at Katie's Table to raise money for Katie's Fund. This year we will be selling your secondhand jewelry for $1.00 per item (yes, only $1.00 each!) as well as other items. Katie's Table will be in the Maple Ballroom at Lakepoint State Park. Please bring your items to be sold to Maple before the start of the convention. Katie's Table will be open for your shopping pleasure before and after each plenary session. Cash or checks only will be accepted.